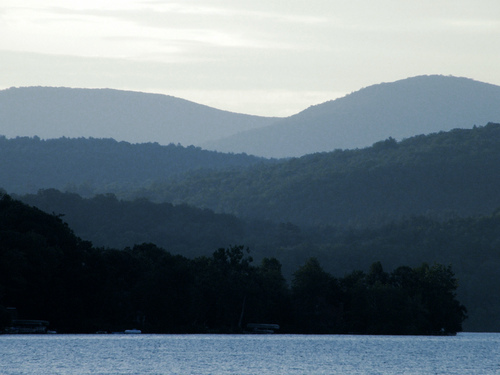 In June of 2015, Poultney Mettowee Conservation District (PMNRCD), in collaboration with the Lake Bomoseen Association (LBA), received a $24,000 grant from the Vermont Department of Environmental Conservation’s (DEC) Ecosystem Restoration Program (ERP) to identify projects that will improve water quality in Lake Bomoseen. PMNRCD and LBA hired Fitzgerald Environmental Associates, a small, Vermont-based firm specializing in applied watershed science, to provide consulting services, and partnered with the Rutland Regional Planning Commission for planning and town outreach support. Ethan Swift, Vermont Department of Environmental Conservation provided State input. Lake Bomoseen accumulates water from lands in Hubbardton and Castleton and then drains to the Castleton River, eventually draining into the southern portion of Lake Champlain. Lake Champlain is under scrutiny due to elevated levels of phosphorus in the waters, and South Lake has been determined to contain higher concentrations of the this nutrient than the main lake. The Lake Bomoseen Association chose to conduct this stormwater assessment and planning exercise to address the negative impacts of excess sediment and nutrient flows into Lake Bomoseen from the surrounding landscape. The State of Vermont provided funds, as the project assists Vermont’s efforts to meet the criteria set in the Lake Champlain phosphorus mitigation work. The project identified sediment and nutrient inputs to Lake Bomoseen and its tributaries and prioritized them for additional design work and implementation. Project 20: Woodard Marina – Lake Bomoseen project partners recommend paving the small area between the water bar and the catch basin as well as installing a temporary fine sediment filter collar over the catch basin inlet during the spring and fall period when vehicle traffic is greatest on the property. These measures will mitigate approximately one acre of impervious surface which contribute runoff and sediment loading in the lake. We do not anticipate any permitting requirements for these projects. Projects 29 & 30: Kehoe Fishing Access (aka “Green Dump”) – 5 separate areas were identified to work together to address approximately 1 acre of impervious surface which are contributing to runoff and sediment loading directly to the lake at fishing access. Best management practices recommended include enhancement of swales, installation of small, vegetated check dams, a rock lined ditch, native woody vegetation plantings as well as minor grading and drainage improvements and modifications. We do not anticipate any permitting requirements for these projects. Project 38: Thomas Evanoika Fishing Access – Installation of an appropriate diversion structure (water bar or grated trench drain), a gravel infiltration basin along the shoreline, a stone lined spillway, along with minor grading improvements and measures to protect against soil compaction are recommended by the partners to address approximately ¼ acre of impervious surface including a steep road which drains directly to the lake at fishing access off Johnson Spooner Lane. We do not anticipate the need for permits at this site; however it should be confirmed that a VTDEC shorelands permit is not required for the proposed basin along the shore. Project 41: Edgewater Resort and Associated Route 30 Drainage – Several opportunities were identified for reducing sediment and nutrient loading to Lake Bomoseen from the Edgewater Resort, Route 30, and adjacent residential properties. The project area was divided into 6 sub-catchments based on topography and drainage infrastructure to best quantify potential treatment options. Measures identified in this project to reduce the sediment loading to the lake include: ditch excavation and enlargement, water bars, a gravel infiltration basin or raingarden, an outlet structure to handle larger runoff in storm events, as well as simpler measures such as gutters and driveway repairs. The presence of underground utilities will need to be evaluated carefully at portions of this location. These practices will mitigate approximately 1 acre of impervious (including ½ acre of gravel) contributing to runoff and sediment loading directly to the lake across Route 30. Project 42: Float Bridge Road Approaches – In this project, the eroding ditch should be excavated and lined with rocks sized appropriately to withstand high velocity flows through the steep ditch. At least 3 stone check dams are recommended in the lower portion of the ditch where slope decreases as well as a reorientation and stabilizing of the water bar across Campbell Road. These measures mitigate approximately ¼ acre of impervious contributing to runoff and sediment loading directly to the lake on the eastern road approach to the Float Bridge. We do not anticipate any permitting requirements for these projects. Projects 44 & 46: Lower Sucker Brook – The Lake Bomoseen partners considered mitigation measures for multiple areas of bank erosion and mass wasting of valley slopes along the lower reach of Sucker Brook upstream and downstream of the Stables/North Road crossings. The partners recommend that buffer plantings at the two downstream sites be addressed at this time along with a bioengineering approach using an armored toe for streambank stabilization. The two upstream erosion sites can continue to be monitored for stability over time. RRPC continues to meet with the Town of Castleton and is working with them to include flood resilience language in their town plan and to assist with continued town outreach concerning the Lake Bomoseen Stormwater Master Plan. Support of this blog is made possible with funding through Lake Champlain Basin Program.